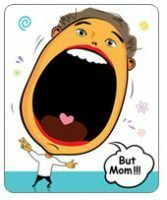 Does your child seem to interrupt every conversation with the words, "But Mom…" or "But Dad…" ? Do they constantly cut you off mid-sentence to tell you that something’s not fair? Interrupting comes from a variety of sources, including over-stimulation, competition with siblings and peers, impulsivity and general family patterns of communication. It’s helpful to pinpoint what combination of these factors contributes to the behavior that you’re seeing your child display. Whatever it is, the most effective thing to do in the moment is to calmly and simply say, “Don’t interrupt me until I’m done.” If the child doesn’t stop immediately, turn around and walk away. Practice that consistently, and it will change their behavior. Secondly, and this is important, don’t interrupt your child when he or she is speaking. It’s important to hear them out if you want them to hear you out. If the interruption comes from impulsivity or poor communication skills, during times of calmness, talk about interrupting and what it feels like to be interrupted. Ask your children what it feels like for them. You can ask, “Have you ever been interrupted by another child at school when you’re trying to talk to the teacher? How did it make you feel?” And tell them it makes you feel like they’re not listening to you. Don’t get into a big emotional deal about it by saying how it hurts your feelings. Just tell them that you feel they’re not listening to you and that it’s important for people to listen to one another. Don’t tell them your feelings are hurt unless it’s real. I also recommend that you sit down with them and teach them how to manage urges and communicate more effectively. There are resources available that can help you to do that, but no matter which one you use, make sure that it teaches everyone to slow things down when they’re communicating. Finally, be aware of what behavior you as parents and role models are teaching them. One of the most effective ways to show children how to change bad habits and communication is to not indulge in them yourself.